Longview Greggton Rotary Club has moved to a new location as of January 4, 2019. They currently meet at Hilton Garden Inn, 905 East Hawkins Parkway, Longview, Tx. Prevent Domestic Violence: Australia Rotary clubs raise awareness and funds to prevent domestic violence and support its victims. Hunted Break Myths: Hunted for body parts and isolated by fear, Tanzanians with albinism are finding new futures through Rotary programs that fight pervasive myths. Rebuild Lives: Canada Rotary club helping refugees from Syria start new lives. Rotary International's four Texarkana Rotary Clubs are hosting a Rotary Foundation Dinner on Saturday, February 23, 2019 from 5:00 until 8:00 in the evening at the Northridge Country Club to benefit the eradication of polio worldwide. Deadline to register is February 18, 2019. 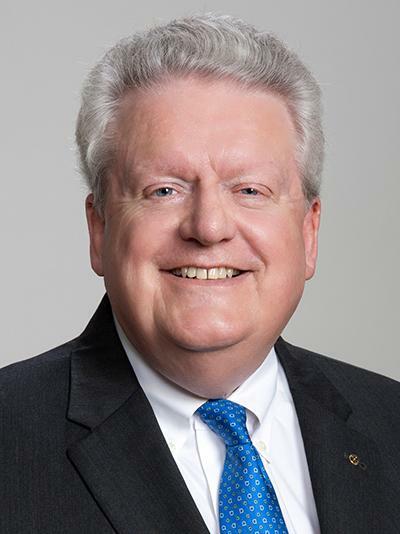 The 2019 Foundation Dinner is open to Non-Rotarians and Rotarians. 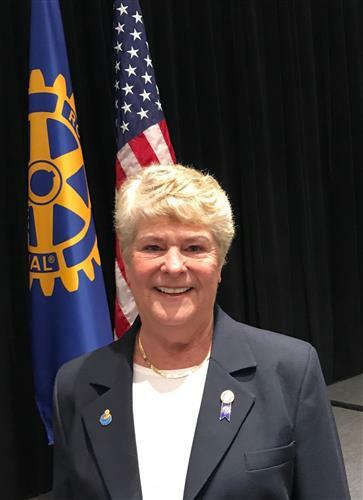 PDG Ann Lee Hussey is our Keynote Speaker and she is traveling from South Berwick, Maine to share an important message about the Eradication of Polio. We want to make sure her message is shared with our community. This is a great time to invite those individual that want to see first hand what Rotary does Internationally and in our Communities. The theme will be Mardi Gras and we are going to have a blast! You can wear your favorite Mardi Gras Beads and/or Mardi Gras Mask! There will be 2 cash bars plus hors d'ouvres and your choice of entrée. We have also blocked some rooms at the Hilton Garden Inn at a reduced rate. Ann Lee has made the eradication of polio and the alleviation of suffering by polio survivors her life's work. Over the past several years she has actively participated in 28 volunteer National Immunization Day teams, organizing and leading the last 24 teams herself, choosing to take those NIDs to places that do not often see Westerners - Chad, Mali, Bangladesh, Niger, Nigeria, Madagascar as well as less “touristy” destinations in Egypt and India – where the need is greatest and where the publicity and goodwill surrounding the trip are as critical as the immunizations themselves to help communicate the need for eradication. She is leading a team to Nigeria in October for her 29th NID. 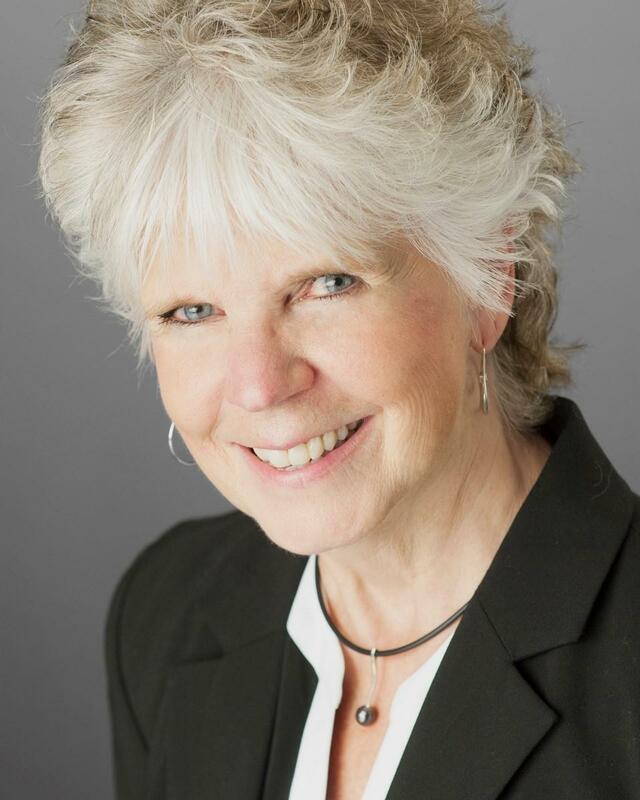 She has shared her story and passion hundreds of times throughout the Rotary world and beyond, raising money and creating new converts to the fight. She is determined that no child will needlessly have to suffer what she herself has been through. As a polio survivor herself, the story Ann Lee tells is personal, and so is her fight to eradicate polio. Please join us on February 23, 2019 for dinner. The cost is $50 with your choice of entree - Chicken Piccata or Beef Filet. Rotarians please register by Feb. 18th at the District Website, Rotary5830.org. There will also be an Iron Lung at the event for those who are too young to remember what it was like for those who were infected with this disease. It is not too late to join us at the Rotary International Convention in Hamburg, Germany, 1-5 June. This issue of Convention News contains important program updates to help you plan your convention experience. Don’t miss your chance to experience Hamburg like a local. Hamburg Host Organization Committee events are almost sold out. See what’s still available and purchase ticketsbefore it’s too late. 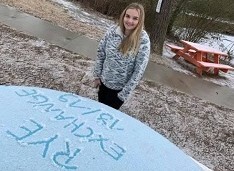 District 5830 Inbound Rotary Youth Exchange (RYE) student, Stella, had the opportunity to join nearly 200 other inbound students from across the globe in Tulsa, Oklahoma at SCRYE weekend. If you haven't had the opportunity to meet Stella yet, I hope you will before the end of her exchange year. She is not only a wonderful ambassador for Germany, but she is also a perfect ambassador for RYE. In addition to taking advanced placement courses at Pleasant Grove High School, Stella was part of the school's fall play. She is also part of the tennis team and has started track practice. Rotary Youth Exchange is a powerful program? If you would like more information on the RYE program please contact Rachel Trimble at RYE5830@gmail.com. 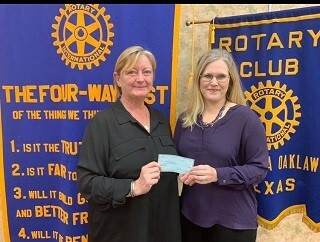 Texarkana Oaklawn Rotary Club donated $600.00 to Randy Sams from funds raised at their annual draw down. The colder weather has seen an increase in people staying at the shelter, which is averaging 100-120 people per night currently. The Shelter will be utilizing the donation to buy 6 mattresses for cots that currently do not have mattresses, proving additional sleeping space. 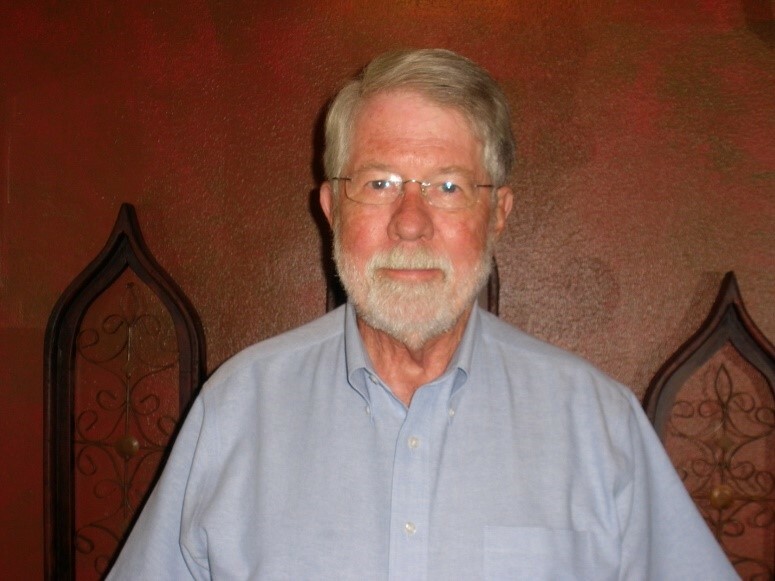 Message to Athens Rotary Club members and the Citizens of Athens, Texas from PDG John Henson, " I think I can speak for all of our 5830 Rotary Family when I say that our thoughts and prayers are with the citizens of Athens as they cope with the terrible accident that took the life of a middle school student and sent others to the hospital. To the members of the Rotary Club of Athens, we are with you." 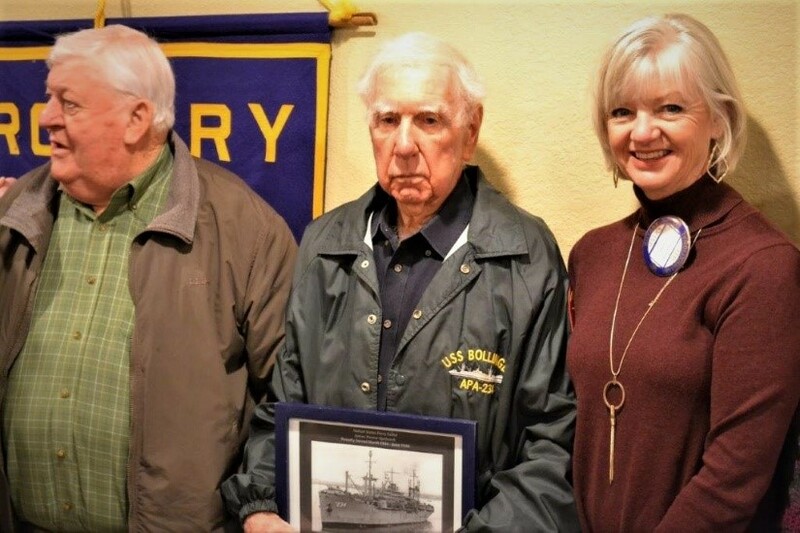 On January 23, 2019, James Upchurch of Texarkana told the Texarkana Sunrise Rotary Club the incredible story of landing at Iwo Jima in the spring of 1945 near the end of WWII. He was a Navy enlisted sailor on the USS Bollinger, a Navy vessel commissioned just one year earlier to carry 1500 Marines to battle. In 1944, Mr. Upchurch joined the Navy as a 16 or 17 year old youngster. Mr. Upchurch, now 92 years old, has become a favorite of the Sunrise Rotary Club of Texarkana since he lives on one of the Club's flag routes. District Assistant Governor, Ralph Waits said, "Mr. Upchurch has been a faithful and patriotic supporter of our Flag Project. He's always there when we put our flags out in front of his house, and he stands at attention and salutes our flag. He's a great inspiration to all of us." The Texarkana Sunrise Rotary Club, composed of 17 very active members, is one of five Rotary Clubs serving the greater Texarkana area. Rotary International is made up of 35,000+ clubs working together to fight diseases like polio, promote peach, provide clean water and sanitation, save mothers and children, support education, and grow local economies. Sunrise Rotary meets most Wednesdays at 7:00 a.m. at the Texas Chuck Wagon Restaurant in Nash, Texas. The public is welcome to attend. D-5830 Rotarians log in to the website using the "Member Login" link in the upper right corner of the page. If you are a visiting guest, feel free to browse this website. If you are interested in finding, or joining a Rotary club in our district please call me at (903) 787-8275. Please furnish a copy of the driver's license of the individual to pick up the trailer, a copy of their insurance card and the location, date, and name of event. Towing vehicle for the trailer requires a 1 7/8 or 2-inch ball and has a plug-in pigtail to hook up lights. Shirley will need a pick up and return date. Contact information for DA Shirley: rotary5830da@gmail.com or 903-787-8275.Each community can only have a priority request for the same event once a year, but they can make a request for the same event every year on the off chance that no one else will want the trailer for that same date.